In this experiment, each participant is assigned a role as a large or small producer of two products. The large producer has an absolute advantage in both products, but each person has a comparative advantage in one of the products. In the absence of trade, each person is limited in the number of balanced combinations of the two goods ("ComBos") that can be produced, and the (partial) specialization that results from trade increases the number of ComBos that each is able to consume. The trade quantity is determined by the minimum of the two participants' trade offers. 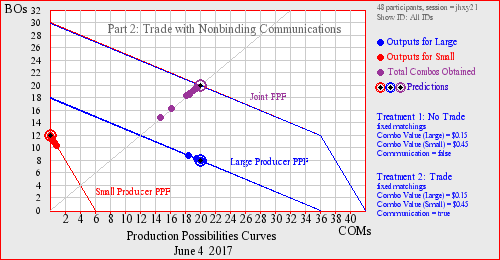 Coordination of production specialization is facilitated by allowing producers to communicate in advance. In large classes, the experiment can be run in asynchronous mode "after hours."